February has decided to be a pal to me this year and grow an extra day, which I really appreciate. I'm glad for this freak 29th appendage because I really wanted to commemorate Black History Month before it ended with this post about one of my favorite drag racers, Kansas City's Roy Drew. I'll be honest, though: I don't know all that much about Roy Drew, and not for lack of trying. What I do know I've mostly found online, on some great sites, and I've even written about him before. I was hoping to discover more to his story, but even an inquiry to the NHRA Motorsports museum in Pomona, CA (who were extremely willing and helpful– they're an amazing resource) turned up nothing. So, I'm hoping that lightning will strike twice– the magic Jalopnik reader network really came through with the James Garner mystery car, so I'm hoping that may happen again here. It's interesting to note that of the major categories of racing in the US, road, off-road, track, and drag, drag racing had probably the most egalitarian beginnings, since, unlike many others, it started on the West Coast, which was somewhat less burdened by segregation than back east, and as a result, had racers from a number of different ethnicities early on. I won't pretend being a black person in motorsports in the '60s was an easy thing, but I think it makes sense that drag racing was more welcoming. But let's start with what I do know, and, even more fundamentally, let's start with the image that started my whole man-crush in the first place: that image above, from a mid 60s Turbonique ad. Just look at that ad. Even without reading a single word, this image says everything that I love about cars and racing and, hell, maybe living, right there. A semi-smashed Beetle, clearly heavily modified and race-prepped. A guy in full race gear, with a helmet that says, incredibly, "Mr.Pitiful." And, best of all, that grin. The caption just makes it even better: "Sorry about that." The ad itself is interesting from an advertising-history standpoint as well. The layout, self-deprecating tone of the copy, and even the typeface choice are all taken directly from Volkswagen's award-winning series of ads by agency Doyle Dane Bernbach. This ad was deliberately made to resemble a VW ad, which adds an element of parody to it as well. Once you do a bit of research, it just all gets better. The car is the genuinely bonkers Black Widow, a rocket-turbine-powered Beetle making around 750 hp. Drew was picked to drive it in the exhibition circuit for Turbonique, an amazingly improbable company that makes the Acme catalog of Wile E. Coyote fame seem like a rational collection of sensible items. Drew and the Black Widow set a record at the Tampa Dragstrip, with 168 mph in 9.36 seconds. The picture is from the Widow's final engagement, when the aerodynamic limitations of the Beetle shape came into play, at 183 mph, causing it to take flight, and then land, unsuccessfully. Turbonique used the "after" picture of the race in the famous ad, and this is pretty much the extent of what I've been able to find out about Drew. 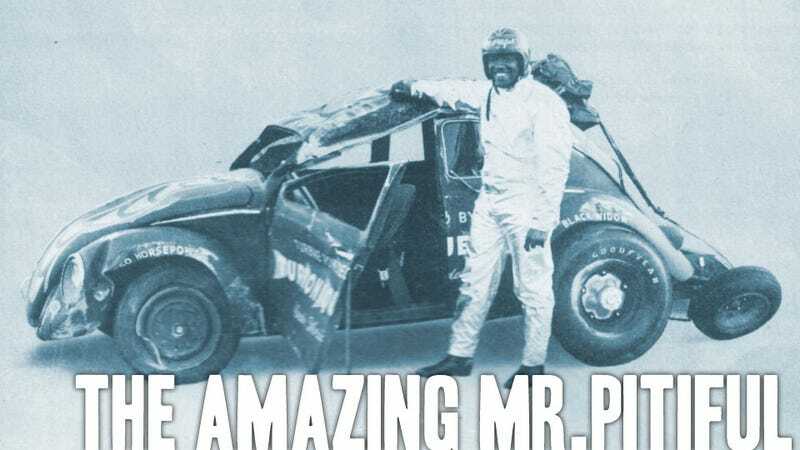 The NHRA Museum did suggest that the name he raced under, Mr.Pitiful, was likely taken from the popular Otis Redding song of the time. Beyond that, they had no other records beyond his work with Turbonique. What I'd love to know is how he ended up racing Turbonique's rocket-powered machines? It seems like it would take a special breed of loon, even in the admittedly special-loon-heavy world of drag racing, to agree to make a career out of racing a 750hp, 1600 lb street car in a world of purpose-built dragsters with multiple screaming V8s and the like. Plus, the Turbonique motors gave all their torque almost immediately, which must have made them, um, challenging to drive. So, if anyone knows more about this very fast son of Kansas City, please let me know, so we can give the man his full due.